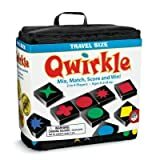 Qwirkle Connect adds bonus point opportunities to Qwirkle. You will need a keen eye – and the right tiles – to get the bonuses and maximize your score. 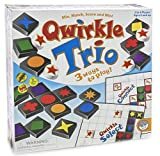 Qwirkle Connect is a part of Qwirkle Trio. Use the green side of the boards. Arrange the game board quadrants to make one large square board. The board quadrants can be combined in many ways. The illustration below shows the recommended set up for your first game. The recommended board when first playing Qwirkle Connect. Another possible board for Qwirkle Connect. Place a randomly drawn tile face-up on each black space. To start the game, put a face-up Qwirkle tile on each of the black spaces. The player with the most tiles that share one attribute plays first. The first player is not required to play his or her largest set of tiles. The first player can place his or her tiles anywhere on the board, as long as one of the tiles is touching a tile that is already on the board. The board starts with 24 tiles that you can play from. 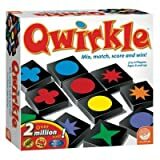 As in Qwirkle, you must play so that at least one of your tiles touches a tile that is already on the board. The numbered spaces allow you to score bonus points. One-point bonus spaces require you to connect two random Qwirkle tiles placed on the board in set up. Two-point bonus spaces require you to create connections further away from the starting tiles. When you play a tile on a numbered space, add the bonus point(s) to your normal score. Only score the bonus once, even if the tile placed on the bonus space is used in two different lines. The player who played the green circle in the upper left of the board scored 5 points. 2 points for the green line, 2 points for the circle line, and 1 point for the bonus space. The player who played the two diamonds in the upper right of the board scored 9 points. 3 points for the diamond line, 2 points for the orange line, 2 points for the purple line, and 2 bonus points for playing on the bonus spaces.